A common question we often hear is: Where can I get boots like Red Wing but cheaper? There are many people who love the look and quality of Red Wing Heritage boots but just can’t justify the $300+ price tag. 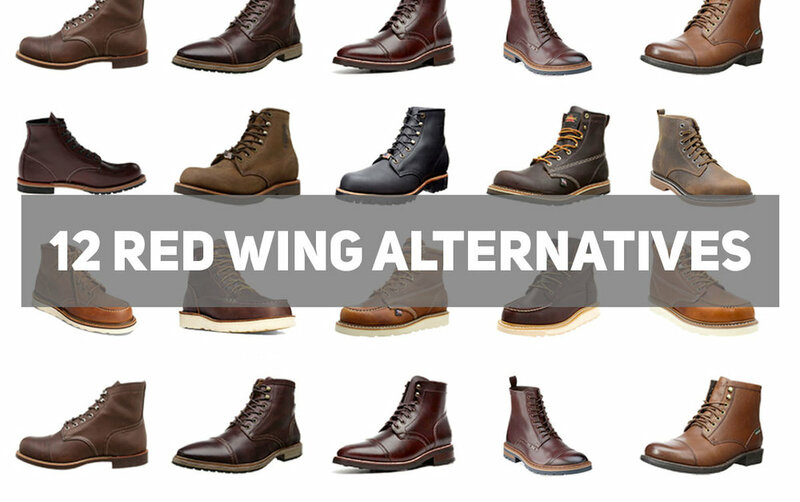 With this list we’ve compiled our favorites Red Wing alternatives and tried to stay under $200 without compromising too much on quality or style. In fact some brands like Thorogood and Chippewa are highly recommended for those of you who still want great quality American made boot at a cheaper price point. Which boots like red wing heritage are you looking for? Below are our pics for the best boots similar to the Red Wing Iron Ranger under $200. There are some differences between the Iron Ranger and the boots featured below in which we point out in the reviews. But for under $200 these boots are the best bang for your buck for anyone looking for a sleek cap-toe work style boot. Florsheim Indie Cap boot - An affordable casual work-style inspired boot. Florsheim makes a viable Iron Ranger alternative for under $200 with it’s Indie Cap Boot. The uppers are made with smooth full grain leather in Chocolate (pictured), Chestnut and Saddle Tan colors. But the Indie Cap Boot also come in Gray and Black colors that feature uppers made of milled and smooth full grain leather for an extra rugged look. The inside of the boot you can find a breathable liner and special cushioned footbed for comfort right out of the box and a minimal break-in period. Unlike some Iron Ranger models, all Florsheim Indie Cap boots have lugged soles for easy traction in rougher terrain and bad weather. For under $200 you can expect a nice ready to wear cap toe boot that can be dressed up or down. 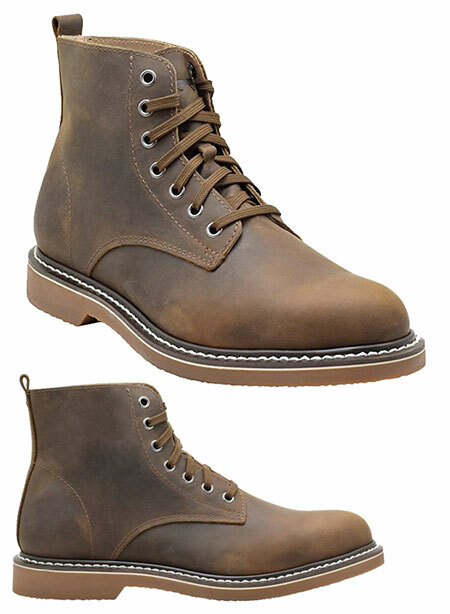 Thursday Boot Company is know for their commitment to quality and affordability and their men’s Captain Lace Up boot is no exception. Their design focuses on being clean, minimal and avoiding the clunkiness often times found in similar style boots. The leather uppers comes in a variety of colors such as brown (pictured), natural leather and black. Quality craftsmanship is in the fine details. Each Captain Lace Up boot features Goodyear Welt construction, full glove leather interior lining, and choice of quality leather sourced from either Horween (USA) or Le Farc Tannery (Mexico). The outsoles are made of studded rubber for great traction. The Thursday Captain boot is a good cheaper alternative to the Red Wing Iron Ranger if you are looking for a slim fitting cap toe boot that still has Goodyear welt construction and quality leather uppers. Rugged. Handcrafted. Stylish. Wolverine offers a true Red Wing Iron Ranger alternative with their Jenson boot. Style-wise, it shares many similarities to the Iron Ranger. Both boots sport a cap toe as well as some contrast stitching on the uppers. Instead of oil-tanned leather, Wolverine opts-in for a full grain leather with a more tumbled texture. The end result is still a rugged boot with a masculine edge. Although we often like to compare the Red Wing Iron Ranger vs Wolverine 1000 Mile, the Wolverine Jenson is the brand’s true Iron Ranger competitor. Where the Wolverine Jenson really shines is in it’s Gore-Tex lining that allows it to be completely waterproof. Add the Jenson’s rubber outsoles and you have a true winter boot that can withstand the elements. The Eastland High Fidelity boot is the least expensive boot on the list. You can usually find a pair for under $100 on Amazon. We added these Eastland boots because of their comfort and nicely done cap-toe design. The boot height is 5” so it’s a little bit shorter than the 6” Iron Ranger heritage boot but overall both the High Fidelity boot has an authentic workwear look that would compliment any casual outfit. We especially love the insole that is made of special memory foam that conforms to your foot with wear. Although it is slip-resistant, the High Fidelity boot has smoother outsole so it’s best not to make it your go-to snow boot during winter months. These are the budget boots for anyone looking for boots like the Iron Ranger but substantially cheaper. The Red Wing Heritage Beckman is known for it’s round toe, S.B. Tanning leather uppers and lugged commando soles for great traction. These features make the Beckman boot an ideal workhorse boot that can stand the test of time. But at a price of $349.99 it can be a bit out of reach for some. With this in mind, we have gathered the best alternatives Red Wing Beckman boot we could find. We took into account boots that were similar in style, construction and utility and best of all at a fraction of the Red Wing Heritage price tag. The Chippewa Apache Rugged boot is a beautifully handcrafted boot that is built to last. Like Red Wing Heritage boots, Chippewa manufactures these boots in the USA. It’s called the “Lacer” because of it’s 3 D-Ring hardware for fast and easy lacing. As with all Chippewa boots, the Apache Lacer boot has quality uppers made of tough Horween Leather. These boots feature an Vibram stockbridge sole. Unlike the more lugged sole on the Red Wing Beckham, these boots feature a Vibram stockbridge sole. These soles do not feature the large “lugs” but they are made for great grip and traction. What you get is a great boot that can be worn in tougher conditions without the fear of slipping. The second Chippewa boot to make the list is the Odessa Rugged Lace Up boot. These boots have tougher Vibram Logger outsoles that can handle the toughest conditions and do very well in snow and ice. Like the Chippewa Apache boots above, the uppers are made of high quality Horween leather that look better with age. This American made boot features Goodyear welt construction, breathable Dri-Lex lining and water resistant. Like the Red Wing Beckham, these boots feature a round bulbous toe for extra room and comfort. To learn more about the difference between Red Wing and Chippewa boots click here. 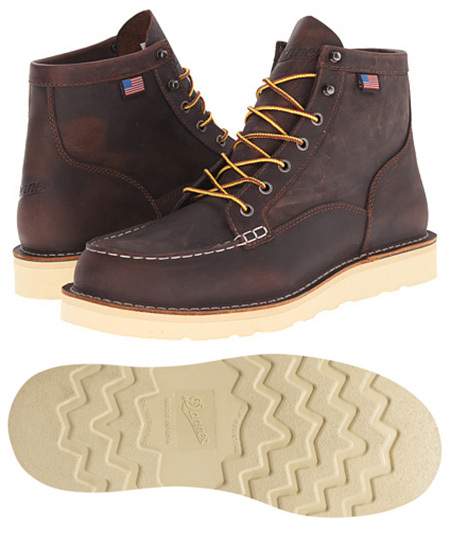 Thorogood is known for their high quailty work boots that are made in America. For those looking for a tough boot that will stand the test of time then this brand shouldn’t be overlooked. We included the Thorogood Wedge Sole boot in this list of Red Wing Beckham alternatives for it’s round toe style and classic Americana workwear silhouette. Although made as a workboot, the Thorogood wedge toe boot looks great with everyday casual wear. Quality and comfort. These are word synonymous with the Thorogood brand. You can expect less painful break-in periods as compared with other leather sole boots thanks to Thorogood’s memory cushion insole. The quality of these boots are also top-notch: They are made in the USA, feature a beautifully crafted Goodyear Welt construction, and their uppers are made from a tough oil-tanned leather that only looks better with age. With a price tag of under $100, the Golden Fox Boondocker Service Boot comes in as the most affordable Red Wing alternative to make the list. Golden Fox really hit a home run with these great looking boots. They are available Brown (full grain leather) or in a nice light Khaki (suede). You can click on the Amazon link above to view the available color options. The 6” Boondocker boot features Goodyear Welt construction, double sewn stitching on the uppers, and a pig-skin collar. It’s features like these that make these boots a great deal. One difference between these Golden Fox boots and the Red Wing Heritage Beckham are the soles. Unlike the Beckham’s lugged soles, the Golden Fox Boondocker features a crepe sole. This may not be ideal for anyone looking for a rugged winter boot. But overall the Golden Fox Boondocker this is a great looking round toe boot for a fraction of the Red Wing price tag. We compare and review the best boots similar to the Red Wing Heritage Classic Moc boots. These work boots are great quality, expertly crafted, and under $200. Use the chart below for a quick comparison and keep reading for more in-depth reviews. Danner is known for their beautifully crafted and high quality boots that are made in Portland, Oregon Their Bull Run Moc Toe boots are heavy duty 6-inch workhorse boots built for performance and durability. Features include comfortable polyurethane footbeds and non-marking, oil & slip resistant wedge outsoles. The upper is made out of oiled full grain leather which Danner says will mold to your foot for a minimal break-in period. The soles and heels are made of non-conductive material to avoid electric shock. These work boots are unlined and do very well in warm/hot weather. The Thorogood American Heritage Moc Toe boot is the second USA Made Red Wing Heritage alternative to make our list. We absolutely love these boots. Not only are they more affordable than the Red Wing Classic Moc Toe boot but they are high quality and very comfortable to wear with a significantly shorter break in period needed. Like Red Wing boots, these Thorogood Moc Toe boots feature a great Goodyear Welt construction and a slip-resistant wedge outsole. These boots feature Tobacco Gladiator Oil-Tanned leather on the uppers and on the inside features a removable comfort cushion insert that can be replaced over time. 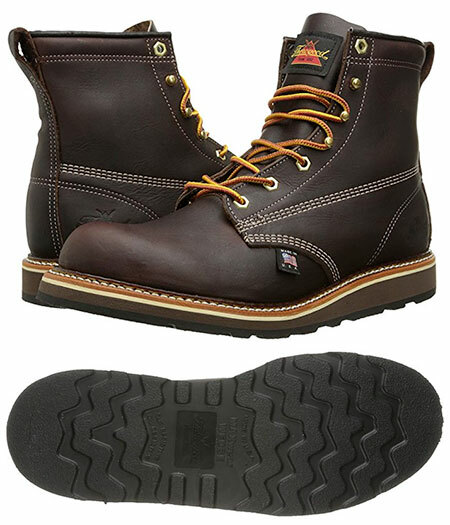 The Irish Setter Ashby 6-inch wedge work boot is a great cheaper alternative to the Red Wing Classic Moc Toe boot. The cheaper price point doesn’t sacrifice much as both boots feature Goodyear Welt construction, S.B. Tanning leather uppers and slip resistant outsoles. These Irish Setter moc toe boots are not manufactured in the USA, but they do feature American made full grain leather from the S.B. Foot Tanning Company in the uppers - this is the same leather used in Red Wing boots. The outsoles are heat resistant up to 475º F and feature Rubber-EVA traction treds for great slip resistance. The inside features a removable polyurethane footbed. You can expect a very comfortable wear with little break in period with Irish Setter boots which makes it a big plus. These Golden Fox 6-inch boots are the most affordable moc toe boots to make the list of Red Wing Heritage alternatives. You can usually pick up a pair for under $100. But don’t let the cheap price point fool you, these boots feature Goodyear Welt construction, oil-tanned full grain leather uppers, and oil resistant wedge soles. The Golden Fox Moc Toe Wedge boots are made for utility without sacrificing comfort. The inside of the boot features a dual cushion insole that is removable as well as a pig skin padded collar around the ankle. There is also a mesh lining inside the boot to help with moisture wicking. With all of these features in mind, Golden Fox makes a great Red Wing alternative for those on a budget. Both Red Wing and Chippewa offer great quality boots and share some similarities. But here we are going to point out the main differences so you can make a more informed boot buying decision. Differences in leather: One thing to note when choosing a new pair of boots is what kind of leather each brand features on their uppers. Red Wing uses S.B. Tanning leather on their boots while Chippewa uses Horween leather. Both of these leathers are manufactured in the USA and are high quality leathers. On the Beckham boot however, Red Wing uses a more “dressy” leather that can be found in dress shoes. Chippewa uses a rougher leather that is more on par with work boots. Red Wing vs Chippewa : Made in USA Both brands manufacture their boots in the USA. 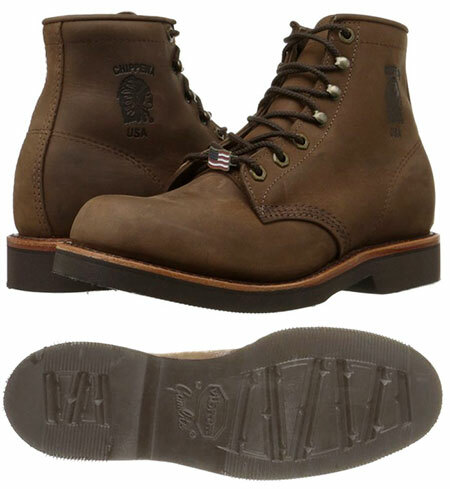 Chippewa boots however are made in the USA from imported materials, namely their Vibram soles that are made in Italy. This does not necessarily mean a lower quality boot as their boots are each handcrafted by American workers. Different soles: The soles on the Red Wing Beckham are lugged to handle tougher weather conditions but some Red Wing Iron Ranger models come with smoother cork soles that are not ideal for wet or snowy conditions. With Chippewa boots you will get thick Vibram soles that are usually lugged. These Vibram soles do much better in inclement weather and is something to keep in mind if you plan on wearing your boots in the winter months. Conclusion: We at FindYourBoots do believe that you shouldn’t skimp on a great pair of boots. And we encourage everyone in the market for a new pair of boots to purchase the best quality they can afford. So just to keep it honest we will say that some of the boots on this list will not be as good quality as authentic Red Wing heritage boots: You just can’t beat the quality leather, handcrafted build, and overall quality that comes from a Made in USA Red Wing Heritage boot. But we’ve done our best to recommend the best quality cheaper alternatives to Red Wing boots that we could find.